The Enforcer two way wireless system is the first truly high security wireless product on the market, where it can only be compared to an addressable wired system (but instead of using a wired bus it uses a wireless bus). The Enforcer 32WE supports 32 wireless and 34 wired inputs, 2 wireless external sirens, 32 keyfobs and proximity tags, 75 user codes, 19 programmable and automation outputs and a large variety of wireless accessories. The Enforcer 32WE is able to communicate to alarm receiving centres via a high speed PSTN or GSM modem. It combines unique automatic remote diagnostics features (ARM) for installers with the ability to communicate with the user via extremely user friendly SMS messages. The Enforcer two way wireless technology is designed to ensure high security protection for users and simple and easy installation and maintenance for installers. Enforcer system uses narrow band 868MHz frequency and is able to reach up to 1.6km wireless range in open space. No matter you are at home or have gone outside, this KK-1256 105dB Remote Control Type Doors and Windows Security Alarm for Let / Commercial Suite / Single Apartment can offer you all-round security and allows you to live a peaceful and easy life! The unique 105dB super loud alarm design it adopts will effectively scare the baddie away. And the remote control operation provides you with more convenience and benefit. Moreover,our security alarmis powered by 2pcs AAA batteries and low battery indication is available to remind you of charging it in time. A reliable protector for you! 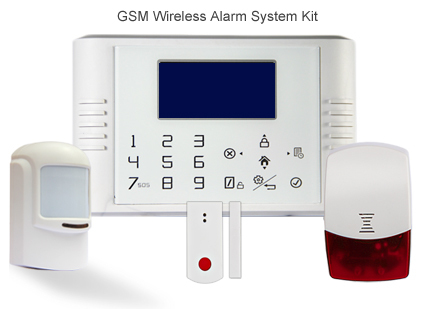 VT-G992E is a GSM and PSTN intelligent home alarm system. This LED display alarm system is equipped with dual network GSM & PSTN technologies and suitable for both home and commercial use. It uses advanced GSM technology, GSM Wireless mobile and traditional PSTN landline networks with intelligent alarm system. It has highly integrated digital voice, SMS, self-learning wireless communication code, and textmessaging technologies. The alarm provides automatic voice or SMS messaging as notification for incidents. It is a choice of stability, reliability, security, and user-friendliness. Features are very practical, cost-effective, and easy to use. This LED display alarm can integrate with many alarm accessories including door sensors, smoke detectors, gas detectors, emergency buttons and other accessories to build a powerful security setup. It has been widely used in homes, factories, schools, shops, convenience stores, financial and banking workplaces, community centres and residential areas to provide protection to valuable assets. An Emergency Assist Alarm is defined in Building Regulations Approved Document M, and must be provided at all disabled toilets within non domestic premises, if the toilet is in a non permanently occupied space, remote indication must be provided at a central control or monitoring point. An Emergency Assist Alarm can only be reset by attending the location of the call, so the reset point is within the cubical, also allowing accidental calls to be cancelled by the toilet occupier. The Emergency Assist Alarm System can be powered from the local exchange or compact unit, and is fully monitored over and above the specification described in C4A-4. The Garvan SS-168 Smoke Alarm is an ionization 9V DC smoke alarm. It is operated by a 9V battery (6LR61 or 6F22), battery life 1 year minimum. With the ionization technology, SS-168 will normally respond faster to fast flaming fires which spread rapidly and general considerable heat with little smoke. The SS-168 has an 85 decibel horn, test button, alarm LED indicator. SS-168 should be installed in every room (except the bathroom), and every other area of the home, making sure the people in the home will be able to hear and respond to the alarm sound. For minimum protection you should fit an alarm in the hallway between the living areas (incl. Kitchens)and sleeping areas. Place it as near to the living areas as possible and ensure the alarm is audible when the bedrooms are occupied.